Earlier this week my friend Simon invited me for a dinner and he kindly came up with a delicious LCHF meal I hadn’t tried before. Below is the recipe, hope you enjoy it! Rinse chicken, drain, slice into thin fillets. Sprinkle with salt (doesn’t have to be to much as the ham is salty) and black pepper and wrap in slices of serrano ham, set aside. Wash asparagus, snap off woody ends of the light (the same break in the right place). Add to basket steamer or put in a sieve. Strainer basket or hang on a pot of boiling water and cook for 5 minutes until asparagus is tender. Do the same with the broccoli and set aside. In a skillet heat 2 tablespoons olive oil and place chicken breast prepared in ham. Cook for 6 minutes, then transfer to the other side and cook for another 5 minutes. 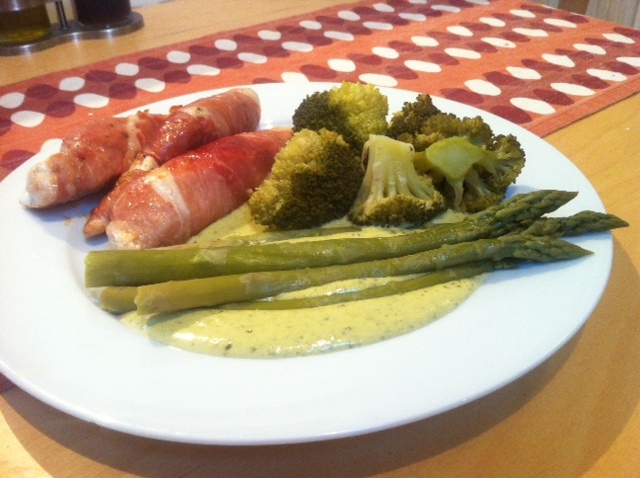 While chicken breasts are getting ready, pour the cream into a saucepan, add the pesto and mix gently. Let it boil slightly and season if necessary with salt and freshly ground pepper. Serve the meal and enjoy!